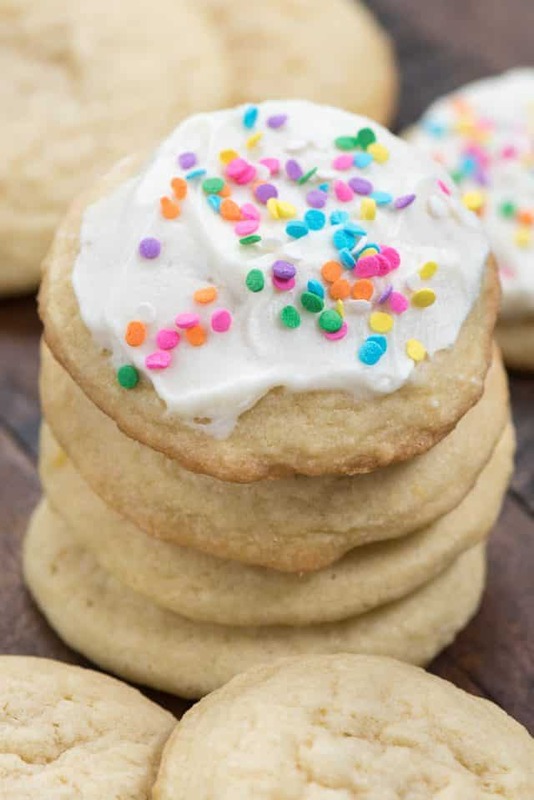 This is the BEST soft sugar cookie recipe! 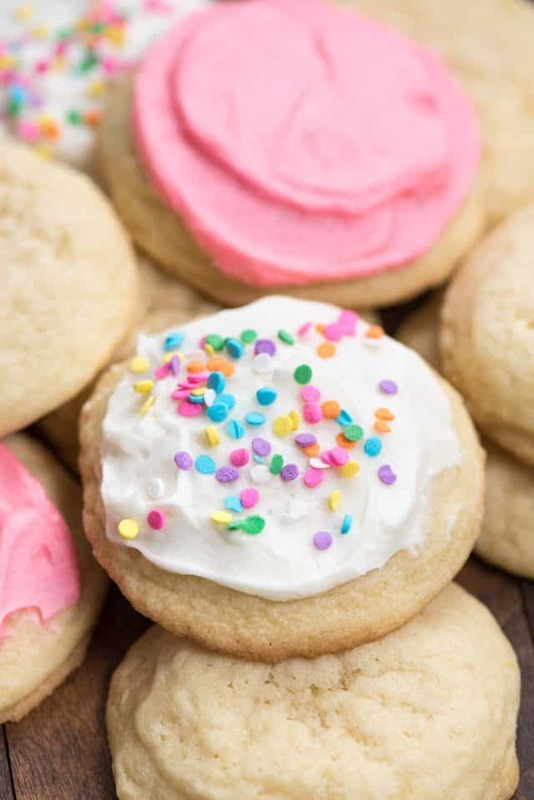 These drop sugar cookies are chewy and soft and perfect with or without frosting. I know I always say something is the BEST or PERFECT, but these really are. I’ve fine tuned my “perfect” recipe so that they’re not only soft, but chewy too. When I made these for a party everyone absolutely RAVED about them! You’re probably thinking…wait. Doesn’t she already have a sugar cookie recipe? Or two? And yes, you’d be right. But I’ve fine tuned my perfect sugar cookies to make them soft and chewy! 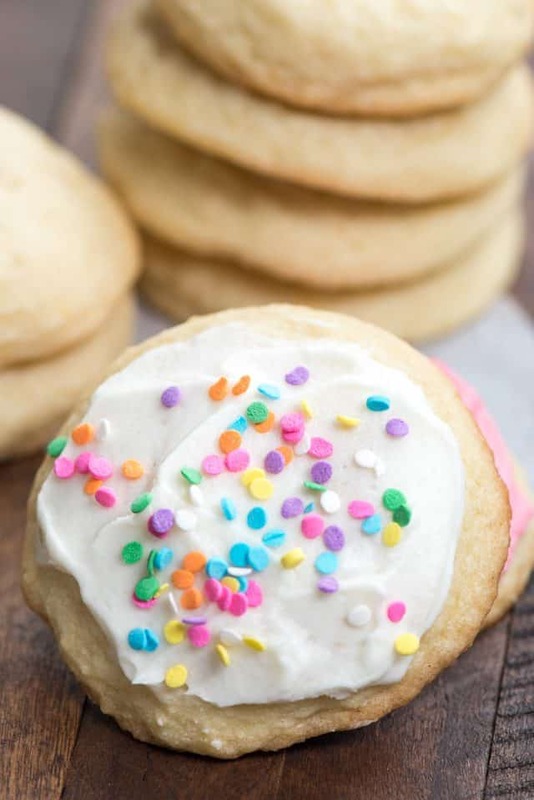 This is an easy drop sugar cookie recipe that turns out the perfect sugar cookie that’s melt in your mouth soft yet chewy at the same time. The best part about these sugar cookies is that they’re amazing with frosting, but they’re also good plain. Plus, you can vary the recipe in so many ways. If you’re looking for sugar cookies without baking powder, this is the recipe. These are thick, soft sugar cookies with icing (or without). They encompass all the best things about a sugar cookie recipe! I served these at a party recently and every single person who tried one went nuts over them. I think I spent an hour combined listening to the sighs of delight and the raves about taste. Okay, now for Cookie Science 101! Butter – a good sugar cookie uses butter. Butter flavored shortening is okay, but to get that traditional sugar cookie flavor, you need butter. Use unsalted butter to control the amount of salt. If you’re using salted butter, reduce the amount of salt in the recipe by 1/4 teaspoon. Sugar – this recipe uses granulated sugar. My cutout sugar cookie recipe uses powdered. We’ll go into that too. Egg – eggs provide structure in baking. It’s hard to replace an egg in cookies and still get the right texture. Flour – all-purpose flour is the normal cookie flour. You want to add just the right amount so the cookie is dry enough not to flatten out, but not so dry that it crumbles. Leavening – this recipe uses a combination of baking soda and cream of tartar (more on that in a minute). What kind of sugar do you use in sugar cookies? A traditional sugar cookie needs white sugar to be, well, traditional. Brown sugar is delicious in cookies, but then it wouldn’t be an old fashioned sugar cookie. Normally, sugar cookies only contain one kind of sugar (granulated or powdered), instead of a combination of sugars, like in a chocolate chip cookie. You will recall, however, that my cutout sugar cookies use powdered sugar. So, what’s the difference between powdered sugar and granulated sugar in a cookie recipe? Besides flavor, granulated sugar helps with spread of the cookie. In a drop cookie, spread is okay and expected. However, in a cutout sugar cookie or snowball cookie, you don’t want spread. Powdered sugar includes cornstarch, which helps with binding and reducing spread. For a normal drop sugar cookie recipe, granulated sugar is the way to go. Why do you use baking soda in cookies? Cream of tartar is normally used in egg whites and meringue, but it’s also a great addition to sugar cookie recipes. Cream of tartar helps with the chewiness of cookies and, when combined with baking soda, is almost like a double-acting baking powder. I know it’s kind of an obscure ingredient, but it’s always good to have in your pantry. These sugar cookies without cream of tartar won’t be as chewy and will be flatter than with it. Plus, when you make snickerdoodles, you want cream of tartar for that telltale tang. What’s the secret to a soft but chewy sugar cookie? Ah, that’s the question of the day, isn’t it? But for one ingredient, this recipe is so similar to my perfect sugar cookie recipe. In baking, eggs provide structure. Egg yolks add fat, egg whites add the structure. Two eggs in a sugar cookie is just too much egg; it makes it more cake-like than a cookie. One egg in this recipe makes a soft sugar cookie, but it’s not chewy. One egg plus an egg yolk is the perfect ratio of egg for the perfect chewy sugar cookies that are still soft and pillowy. Combined with the magic that the combination of baking soda and cream of tartar work, an extra egg yolk is the key to the chewiness of these cookies. Use real butter, not fake. Use granulated sugar because these are a drop sugar cookie. Buy yourself some cream of tartar so that your cookies have some chew without the spread of just using baking soda. Add an extra egg yolk to complete the perfection of this chewy soft sugar cookie. 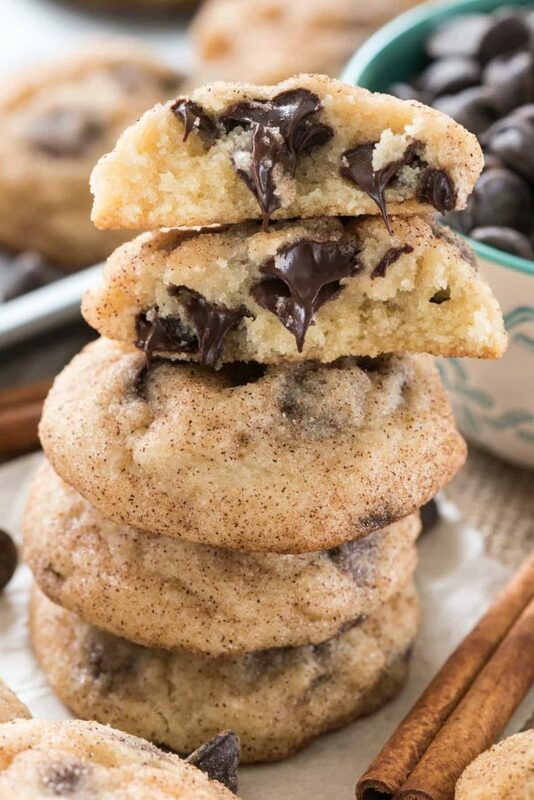 Make chocolate chip sugar cookies by adding 1 cup of chocolate chips to the batter and skipping the frosting. 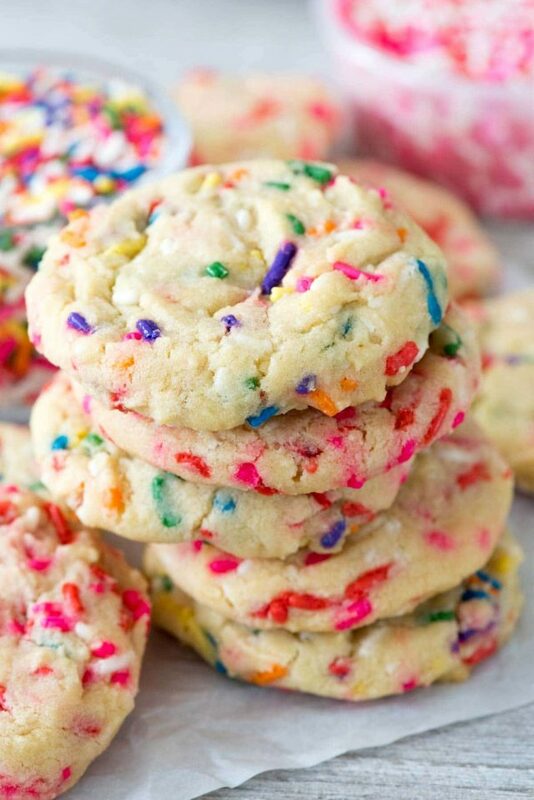 Add 1 cup of sprinkles to the batter to make a sprinkle cookie (omit frosting). Roll the cookies in sugar or cinnamon sugar (reminiscent of snickerdoodles) and skip the frosting. Flavor your frosting with lemon juice or a bit of cocoa to make a new flavor! 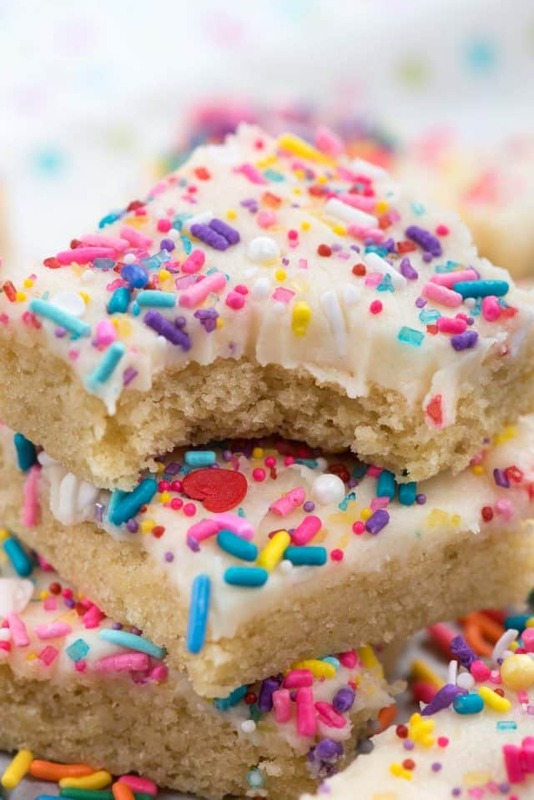 However you make them, this easy sugar cookie recipe will be a hit with your family! Prepare for rave reviews, I promise! Add the egg, egg yolk, and vanilla and mix until smooth, then mix in baking soda, cream of tartar, and salt. Add flour and mix until cookie dough forms. Scoop 2 tablespoon sized balls 2-inches apart on cookie sheet. Bake for 11-15 minutes, or until the bottoms are just starting get golden and the top is no longer glossy. Cool at least 10 minutes on cookie sheet before removing. Cool completely before frosting. Mix butter in a large bowl with a hand mixer until smooth, then slowly mix in the powdered sugar a bit at a time. The mixture will be very crumbly. Add the vanilla and mix, then mix in the salt and milk. Beat until smooth and creamy. Tint with food coloring, if desired. Frost cooled cookies. Store loosely covered. Scoop balls of cookie dough and roll them in sugar or cinnamon sugar before baking. Skip frosting. Add 1 cup of sprinkles to the dough before scooping. Skip frosting. These are so pretty! And I would have loved to be at your house when you were serving these oohing and ahhing along with everyone else! hey girl- these sugar cookies look amazing! These sound heavenly…wish I had some now. Hi, I love you recipes!!!!!! In this recipe I can to substitute the cream of tartar……can you help me, please??????? Thank you for explaining why certain ingredients are used – I can’t wait to make these! Just made these chewy soft sugar cookies – amazing, exactly as you described. This recipe is a definite keeper! Made the frosting too…had to add a bit more confectioners sugar but perfect for the cookies. yours and saw the cream of tartar addition. Knew it would make them special. Loved these cookies! My boyfriend is super picky and sugar cookies are the only cookies he eats, but he wants them soft like the “publix sugar cookies” (for those not in the south, grocery store) and I’m no baking expert so having the science explained was super helpful! Also loved having all the variation options presented, this one is a keeper, thanks! I made these and they tasted just as amazing as they look!! Super moist with a textured outside! I rolled mine in sprinkles, confetti (round disks) and the rainbow sprinkle kind and both came out fantastic!! Thank you! You are a culinary genius!